With technology increasing, and Downhill bike racing becoming a popular sport, bike manufacturers are having to meet the needs of downhill riders. Companies such as Giant, Trek, and tones more, have always stayed on top of the game. The following bikes are some of the latest designs, technologies, and materials which have been moulded into some of the greatest bikes we’ll be seeing in the 2018 race season, and beyond! The Transition TR11 GX is perhaps one of the fastest looking bikes on the list! The Transition is an extremely agile and light weight bike. With less travel at the rear (195mm) combined with the light weight Carbon Fibre construction of the frame, the TR11 is extremely reactive and agile. Featuring Fox factory DHX2 at the rear, and a Boxxer RC at the front, the bike is extremely adjustable and customizable. Coming is small, medium, large, and extra large, the Transition TR11 is made to suit all sizes of riders! The Nukeproof Pulse RS is not only an aggressive looking bike, but happens to hold some of Nukeproof’s latest and greatest features. Being made of Alloy (6061) it certainly doesn’t fall short! Nukeproof’s Pulse RS comes in small, medium, large, and extra large, with a 63 degree head angle on each size, providing a stable, and plush ride. With 10mm more rear travel, improved sensitivity, 200mm front travel, and a greater frame geometric design, the Nukeproof Pulse RS is a revolutionary design put out by Nukeproof. The trusty old Giant Glory 1 coming in at number 3, certainly still holds up to its name! The giant glory 1 now featuring 203mm of maestro set-up suspension at the rear, with a co-pivot rockshox R2C shock at the rear, rockshox boxxer team 200mm-travel fork, and a ALUXX SL-grade aluminium frame, the Giant glory is strong, comfortable, and rides like a dream! The Giant Glory 1, coming is sizes small, medium, and large, fits almost all riders, and certainly suits all levels! At number 2, the Mondraker Summum Carbon Pro Team makes an appearance! 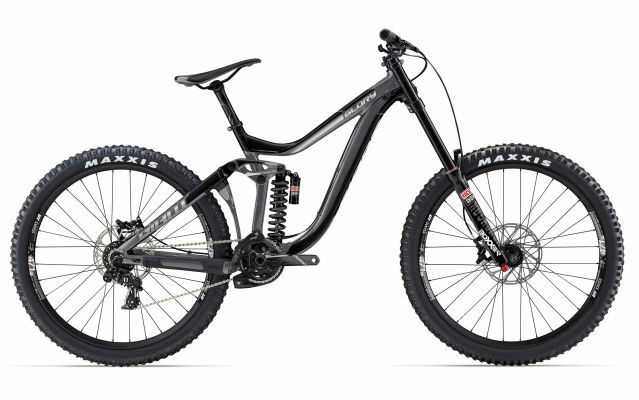 With a 63 degree head angle, full carbon stealth frame, full fox suspension, 203mm travel, and some of the greatest components out, the Summum Pro certainly deserves 2nd place! Coming in Small, medium, large, and extra large, this speed demon is made for all sizes of riders! Not only is this rig a racing machine, but looks absolutely mint, with Saint cranks, Renthal Fatbars/grips, and a full matte finish! Finally, and deservingly, the Trek Session RSL Carbon 2018! This absolute gun just keeps getting better with age. Now with improved stability, comfort, control and a wider variety in sizings; Small medium, large, extra-large, as well as 27.5″ and 29″ wheels, this bike is extrememly suited to any size, fitness, or level of rider. With front and rear fox suspension, the bike has improved customization and personalization of all suspension settings! This particular session has increased the wheel base and reach, giving the bike an overall greater stability. Throughout the coming year, we will see these bikes being ridden by some of the biggest names in downhill racing! For more opinions on the top downhill bikes of 2018, visit RedBull’s top 6 list! Want to ride your downhill bike locally, but cant find trails? Check out our guide to trails in Adelaide here! I had issues with the gear shifting and brakes on my bike, and I found bike shack online, called up and took it in, the next day i went back to collect it and it was as good as new. Bike shack offers a Quality service by a top bloke who knows what he's doing and is really friendly and isn't expensive. 10/10 would recommend.